The Lenovo Vibe K5 will now be available via an open sale from July 4. The is priced at Rs. 6,999 and is exclusively available on Amazon India. The company claims that it has sold over 100,000 units of the Vibe K5 in the last two flash sales. The Lenovo Vibe K5 sports a 5-inch HD display and is powered by a Qualcomm Snapdragon 415 octa-core SoC with 2GB of RAM. It also features Dolby Atmos-enabled speakers. Lenovo today announced that Vibe K5 will be available for everyone via open sale starting 4th July on Amazon.in. 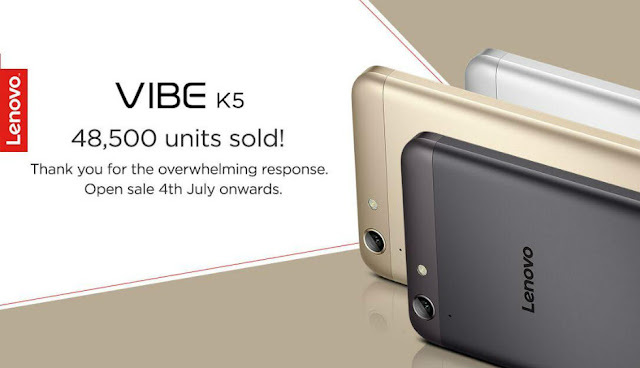 Priced at INR 6,999, Vibe K5 has received an overwhelming response from consumers and over 100,000 units have been sold so far in last two flash sales. Anticipating the demand, Lenovo has ramped up the supplies to go on open sale from 4th July. Lenovo Vibe K5 is powered by a 64-Bit Qualcomm Snapdragon 415 Octa-Core chipset coupled with 2GB of RAM bringing the best Smartphone performance in its class. The vibrant 12.7cm (5) HD display with 720×1280 pixel resolution, gives crisp content streaming and viewing experience. This display along with two high-performance stereo speakers produces the best multimedia experience in this price segment. The Dolby Atmos® enabled speakers to help minimize noise and voice distortion when playing voice clips and songs, automatically fine-tuning any audio experience for listeners. With the beautiful display and power packed entertainment consumers can have an experience like never before. Priced at INR 6999, Vibe K5 also supports Lenovo’s TheaterMax technology and can be used with the AntVR headset (sold separately). Vibe K5 has an all-metal premium design and comes in three attractive colors – Gold, Silver and Dark Grey.